Built-in 25W amplifier broadcasts to 150 people, indoors or out. Separate volume controls for two mics and auxiliary function. 8-3/8w x 5-1/2d x 10-3/4h. 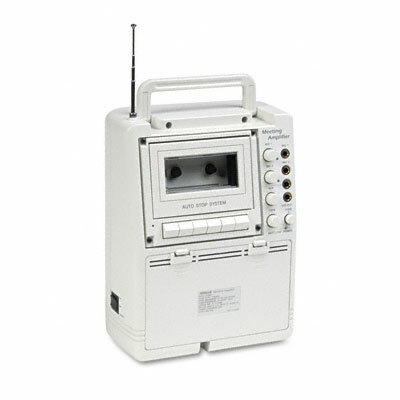 Includes built-in, full featured cassette deck to record or play music during presentation Operates on built-in rechargeable battery pack or plugs into standard outlet Includes clip-on mic and wireless transmitter (9V battery included) for handsfree roaming.